Children in Newtown, Conn. returned to classes for the first time since a gunman burst into an elementary school and killed 20 first-graders and six adults, while the grieving community continues the sad procession of funerals. 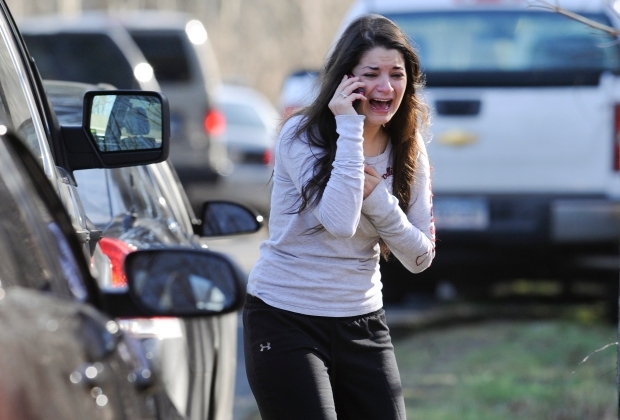 The site of the shooting, Sandy Hook Elementary, didn't resume Tuesday. Students from the school will return to class after the winter break in neighboring Monroe, where a former school building is being made safe and suitable for them. All other schools were supposed to be in session, but Head O'Meadow School was closed because the school received a threat, the superintendent said. Officials have not released information about the threat, but said no students were at the school when it was received. At Hawley Elementary School, apprehensive parents said they had no choice but to try to return to some type of routine. Two more families in Newtown had to bury their youngest members Tuesday: 6-year-old Jessica Rekos was a big sister was known as her family's rock and 6-year-old James Mattioli loved sports and math. Tracie Strahan has their stories. "What are you going to do? Can't keep them in a bubble -- that's not an option," said Keith Muckell, whose daughter returned to classes Tuesday. 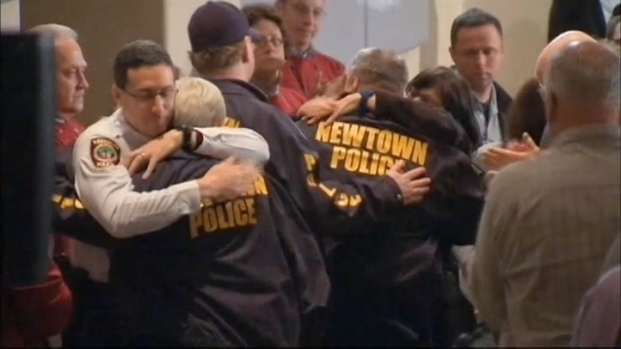 At Newtown High School, students betrayed mixed emotions. Some waved at or snapped photos of the assembled media horde, and others appeared visibly shaken. "There's going to be no joy in school," said 17-year-old senior P.J. Hickey. "It really doesn't feel like Christmas anymore." The crowd for 6-year-old Jack Pinto's funeral was so large, the building couldn't fit everyone who wanted to pay their respects to the little boy who loved football and the Giants' Victor Cruz. Brian Thompson reports. 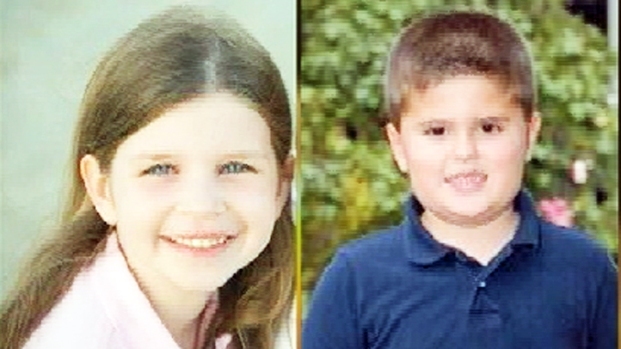 After two 6-year-old boys were buried on Monday, two more children were laid to rest Tuesday in back-to-back funerals -- Jessica Rekos and James Mattioli, both 6 years old. Jessica's family described her as a "creative, beautiful little girl" who loved everything about horses and had been promised one of her very own when she turned 10. "We can not imagine our life without her," Jessica's family said in a statement. "We are devastated, and our hearts are with the other families who are grieving as we are." Noah Pozner, the youngest of the victims in the Newtown, Connecticut shooting, was laid to rest Monday afternoon. He was remembered as kind, caring, smart, funny and sometimes even a little mischievous. Tracie Strahan reports. James loved sports and math and wore shorts and T-shirts no matter the weather, his family said. He was a thoughtful and considerate child, who recently chose to forgo a gift for himself and use the money to buy his grandfather a mug for Christmas. The town began burying the littlest victims on Monday, remembering the children by the simple details of their short lives. Noah Pozner, the youngest of the shooting victims, was mourned at a service in Fairfield. Noah had a twin sister, Arielle, who was assigned to a different classroom and survived Friday's attack by the 20-year-old gunman, Adam Lanza. "Words cannot express the unfathomable loss we feel," his uncle, Alexis Haller, said in a eulogy at Noah's funeral, where he described the boy as an animal lover, a good reader and excited about a birthday party he was to attend the day after he was killed. Noah's schoolmate Jack Pinto was recalled for his love of many sports, especially the Giants, and his expressive face. "Jack loved school, reading, wrestling, skiing and football," his family said in a statement. "Most of all Jack loved to play with his friends and keep up with his big brother. He had a wide smile that would simply light up the room and while we are all uncertain as to how we will ever cope without him, we choose to remember and celebrate his life." Connie Sullivan, a teacher at Newtown Elementary School, barricaded her students in a closet to protect them from the shooter. Connecticut Gov. Dannel Malloy and his lieutenant governor each attended a funeral Monday and spoke with grieving relatives. "You try to feel their pain, but you can't. ... and you see little coffins and your heart has to ache," Malloy said. A fir tree opposite the funeral home was strung with paper angels carrying the names of everyone who died, including the teachers. At Noah's funeral, well-wishers placed two teddy bears, a bouquet of white flowers and a single red rose at the base of a maple tree. The victims in the attack were all shot multiple times. All of the children -- eight boys and 12 girls -- were younger than age 10. Malloy said Monday he was calling for a moment of silence on Friday at 9:30 a.m., exactly one week after the rampage. He said houses of worship would be asked to toll their bells 26 times, one for each victim. Here is a list of victims and here is a collection of profiles about them. The fire marshal of Monroe, William Davin, said the new school for relocated Sandy Hook students should be ready "in a matter of days." Davin said he toured the former Chalk Hill School on Monday with state and local fire and building officials. It has not been used as a school since June 2011. Lt. Brian McCauley of the Monroe Police Department stressed no date has been set for opening the refurbished school. He said there will be a police presence when students arrive. Meanwhile, police continued processing evidence from the crime scenes. Federal agents said Monday that Lanza had fired guns at shooting ranges in recent years but that there was no evidence he did so recently as practice. Officials have yet to reveal a motive. Asked on the "Today" show Monday whether Lanza's mother had ever reached out to mental health or law enforcement officials out of concern for her son, Vance said investigators were looking into the possibility. "We're going to go back historically as far back as we need to go to determine if in fact there was anything of that nature that may have been involved prior to this tragedy occurring," he said.